Having high blood pressure (also known as hypertension) is linked with greater risks of developing diabetic complications, such as retinopathy, nephropathy, heart attack and stroke. Blood pressure varies through the day but your resting level should be below a specific target value. For people with diabetes, the blood pressure target is to achieve a reading below 130/80 mmHg. There are a number of ways in which your resting blood pressure level can be improved, without the need for blood pressure medication, which can help to reduce your risk of developing complications. The NHS advises people to consume a smaller daily intake of sodium (salt), to help reduce blood pressure levels. The NHS advises to consume less than 6g of salt in a day. Many of the prepared foods available, such as breads, cereals and ready meals, tend to have relatively high quantities of salt. Salt helps to provide food with flavour and takeaway foods will typically use relatively high quantities of salt to increase flavour. With home cooked food, you can exercise more control on your salt intake. Note though that one teaspoon of salt provides the daily target of 6g of salt, so bear this in mind if you use salt in your cooking. Physical activity is known to be beneficial for reducing blood pressure levels. The NHS advises people undertake 2 and a half hours of moderate physical activity each week or 1 hour 15 minutes of vigorous exercise. If you are currently not so active, the British Heart Foundation recommends building your level of exercise up from a couple of 10 minute sessions each day. Overconsumption of alcohol over a sustained period of time has been found to contribute to higher levels of blood pressure. It can be easy for us to not be aware of when we are drinking too much. The NHS advises us to cut down on alcohol and keeping a drinks diary can be helpful in assessing whether you are drinking too much. The British Heart Foundation lists quitting smoking as the single most important factor in improving heart health. Smoking damages the walls of the arteries which can lead to narrowing of the arteries and raises the risk of blood clots and heart attack. Your GP can help you to quit with a range of options including a 'quit kit' and access to a local 'stop smoking service'. If you are overweight, you are more likely to have higher blood pressure. The US National Institutes of health notes that even a modest weight loss of 10 pounds (4.5 kg) can help to lower your blood pressure. Mindfulness is a technique recognised by the NHS to significantly reduce hypertension. Mindfulness is the technique of paying attention, on purpose to the present moment. It has been shown to be particularly effective at managing stress, reducing symptoms of depression and anxiety and is a particularly effective technique for people with diabetes as it could improve their blood glucose management, decrease their chances of suffering from diabetes burnout and due to its profound effects on blood pressure it could significantly reduce chances of developing diabetes related complications. Mindfulness is not currently available as a treatment option for hypertension on the NHS. However, you can take part in specifically developed mindfulness course for diabetes, courtesy of StressManagement.co.uk which runs a 10 week course in diabetes management with mindfulness. These days, checking your blood pressure at home is a realistic option for us. 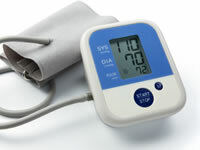 Diabetes.co.uk features a number of blood pressure monitors for home use.